If you visit Birkenfeld, you should definitely plan a side trip to Frauenburg Castle which stands picturesquely upon a narrow mountain spur not far from the vivacious waters of the upper course of the Nahe river. It was built in the year 1320 by the counts of Sponheim ("Back County") and chosen in 1331 by the young widow Loretta, Countess of Sponheim, as the administrative seat for her new office Frauenburg. This after her conflict with the Trier Elector and archbishop Balduin von Luxemburg (1285-1354). In fact, three years before, Loretta had incarcerated the Trier Elector at Starkenburg Castle above Traben Trarbach on the Mosel in order to enforce her ownership of several Sponheim possessions. On the 7th of July 1328, Balduin finally conceded the respective rights to her through the so-called "Atonement Contract", with which the "Birkenfeld Dispute" was officially resolved. With the additional acquisition of the ransom Loretta could purchase and extend Frauenburg Castle. Thereafter, Frauenburg Castle became Loretta's official residence and administrative center of the Frauenburg District with the villages "Tal-Frauenburg", "Reichenbach", "Ausweiler", "Hammerstein", "Nohen", "Rimsberg", "Homerischer Hof" and "Winneberger Hof". Loretta died in the year 1345 at the age of 50. In the years 1673-1674 Frauenburg Castle was substantially damaged during several attacks by French troups. 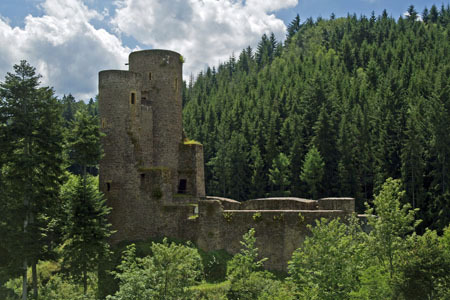 Even though abandoned by the end of the 17th century, it is one of the best-preserved castles in the Birkenfeld District and can serve as an impressive example of medieval power politics.